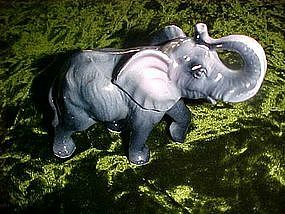 Nice vintage elephant figurine made of hand painted glazed ceramic. Hollow in the feet and has been glued on something in the past. Measures 3 1/4" tall and is about 4 1/2" long. Perfect condition with no chips or cracks.